The Most Flavorful Burritos Ever!!!! This is one of the most popular recipes in the cookday group. Accidently I had it labeled wrong, so to my surprise there were burritos left in the freezer! Talk about an easy meal! Making the burritos in the first place is time consuming, but well worth the effort. On a busy evening, just take them out of the freezer and bake or grill them for a crispy tortilla. The kids are always in a hurry, so they microwave them and have a soft shell. Cook tomatoes, onion, red pepper, garlic and spices until liquid is gone. Cool in a colander to drain any remaining liquid. Measure remaining sauce and divide by number recipes ordered. Spoon the amount of sauce, the beans and rice into the individuals meat and stir. 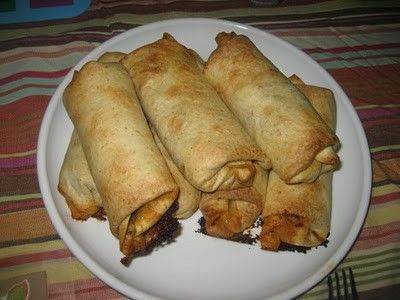 Place about 3 T cheese and ¾ C meat mixture into each tortilla. Fold ends and sides over filling. 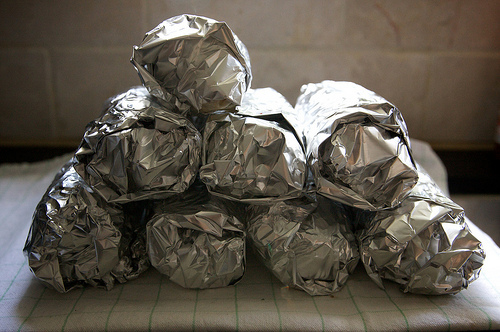 Wrap burritos individually in foil and place in pan or place seam side down in pan. Grill burrito in foil over low heat until warmed, about 15 minutes. Great for camping! Serve with sour cream, guacamole, salsa, chopped tomatoes, or fresh cilantro.